Figure A62. Mongolia anomaly, interpreted as the Mongolia slab, with (horizontal) [vertical] cross sections through (A)[D] the UUP07 p-wave) and (B)[D] the combined SL2013 and S40RTS s-wave models at 1770 km; C) the location of the modern geological record that we interpret to have formed during the subduction of the slab. The Mongolia anomaly (Figure A62) is located below northeast Asia within the mid-mantle. In previous studies it was interpreted as a Pacific slab (Van der Voo et al., 1999a). In van der Meer et al. 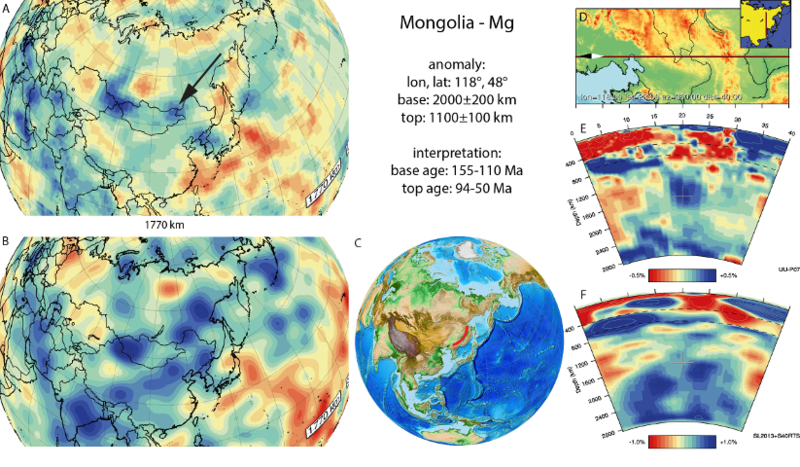 (2010), we used the Kamchatka-Kuriles slab (shallower in the mantleP) and Mongol-Kazakh slab (section 63) to infer that the Mongolia anomaly represents (westward) subducted Pacific lithosphere with a Middle to Late Mesozoic subduction age range. Nokleberg et al. (2000) and Golonka et al. (2003) inferred westward subduction of Pacific lithosphere at the north-eastern margin of Asia associated with the continental margin Khingan arc. This arc consists of mainly Barremian (130.8-126.3 Ma) to Cenomanian (100.5-93.9) andesites and basalts and related intrusives (Nokleberg et al., 2000), which we previously used to date the slab. Further south in the Songliao and neighbouring basins (Ren et al., 2002) documented an earlier start of volcanism, between 155-140 Ma. We therefore now adopt a somewhat wider age range of subduction with onset and end at 155-126.3 Ma and 100.5-93.9 Ma, respectively.